Listen to the Experts: Why You Shouldn't Neglect "The Fifth Room"
It's hard to ignore all of the new indoor/outdoor designer collaborations that have been popping up everywhere. Barclay Butera for Castelle, Martyn Lawrence Bullard for Perennials, Thomas O'Brien for Century, and Libby Langdon for KAS rugs, to name a few. Part of what's driving all this interest is revealed in the category name: Indoor/Outdoor. Clients want versatility and durability throughout their homes, and outdoor-grade materials fill the bill. "As a designer who designs homes for real families with pets, kids, and friends who drink red wine, I often recommend using an outdoor rug indoors," Libby Langdon told us. "It’s practical but you’re not losing any of the design or wow factor. The materials that outdoor rugs are constructed in now are just as soft to the touch and as luxurious, and have as beautiful feel as many indoor products! I also think the price points of many outdoor rugs speak to the way today’s consumer wants to live, not panicking and worrying about a super-expensive rug getting destroyed. I’m absolutely thrilled with my partnership with KAS rugs and I’m so excited that my products are actually going to be hitting the market and retail floors in the coming weeks!" Santhi Yarlagadda VP of Business Development & E-commerce at KAS, agrees, which was why she was so excited to partner with Libby on an indoor/outdoor line. "We've been seeing a huge push for indoor/outdoor rugs year-round nowadays for several reasons: 1) Indoor/outdoor materials are getting softer and much more livable. 2) Easy-care rugs are what everyone needs everywhere in the house, so if they can replicate the same plush pile of an indoor rug in an easy-care pile, why ever not?! 3) All kinds of looks and aesthetics are being accomplished from coastal and beachy, to tropical to traditional, as well as neutrals. 4) Many of the softer indoor/outdoor rugs are being considered especially great for kids rooms and play areas in the home….added bonus!" But product is only part of the story. It's really about a growing public awareness of the value and importance of realizing the full potential of every square foot of one's space, both inside and outside a home's walls, and creating a seamless experience between indoors and out. Just a little over a week ago at Las Vegas Market, we stopped in to hear what five industry experts had to say about the business of outdoor design, and we weren't surprised to learn that, both for interior designers and landscape architects, it's becoming a very good business to be in. 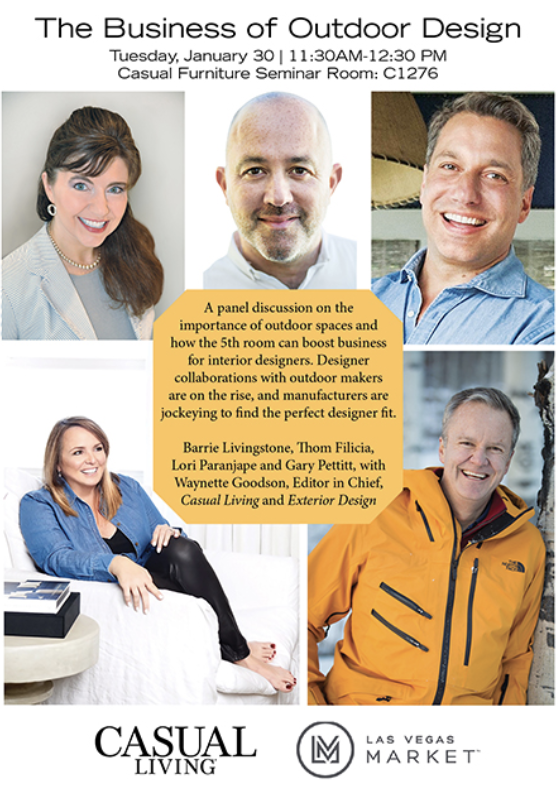 Moderated by Exterior Design's Waynette Goodson, a congenial panel of four --Barrie Livingstone (and his dog Rio), Thom Filicia, Lori Paranjape, and Gary Pettitt--discussed at length how to expand your interior design practice to include outdoor spaces. Expose your clients to the value of designed exteriors in their overall home plans. Thom Filicia says you should "make the outdoors part of your the initial conversation with the client". When it comes to pricing, he says "Come up with a per-square-foot price for different types of rooms in the house. Make outdoor square-foot pricing commiserate with how much it’s used". "Outdoor spaces are a huge asset that add to a home’s resale value", Gary Pettitt chimes in. "It's a shame when someone invests so much to redo their home only to have no budget left for the outdoor areas." Lori Paranjape, whose Redo Home + Design is located in Nashville, feels lucky to have clients who are committed to transformative outdoor design. "Like the one who just decided they wanted their two thousand square foot outdoor space done as part of the overall project. That creates a very nice boost for us!" Clients who wouldn't dream of buying their indoor pieces at big-box discount stores can sometimes have trouble applying those same quality standards to outdoor furniture. The price points at the DIY garden centers have primed people to believe that outdoor should be less expensive, when in fact it often costs as much or more than indoor. Lori says, "15-year warranties are common. When's the last time you found that with indoor furniture?" Thom agrees: "Most outdoor products are considered commercial in terms of durability. Clients should know about warranties and product care." At the mention of product care, Barrie Livingstone was quick to point out that "durable & outdoor grade doesn’t mean maintenance-free! Outdoor furniture needs cleaning & maintenance just like indoors. I live in Malibu and I make sure everything is hosed down once a week. If I didn't, the salt spray would start to destroy my cushions." Fabrics like Sunbrella may seem indestructible, but if you read their warranty information, you'll find that regular cleaning is required to keep it intact. Gary says, "Design specifiers need to understand materials and how your customer is going to live—ask yourself: will they maintain it properly?" Thom says: Anchor pieces are the things you can't easily bring inside, so those will be the most expensive in terms of construction and materials. The easier things are to bring inside, the less you need to spend. Gary says: Outdoor drapery can be a great inexpensive way to transform a space. 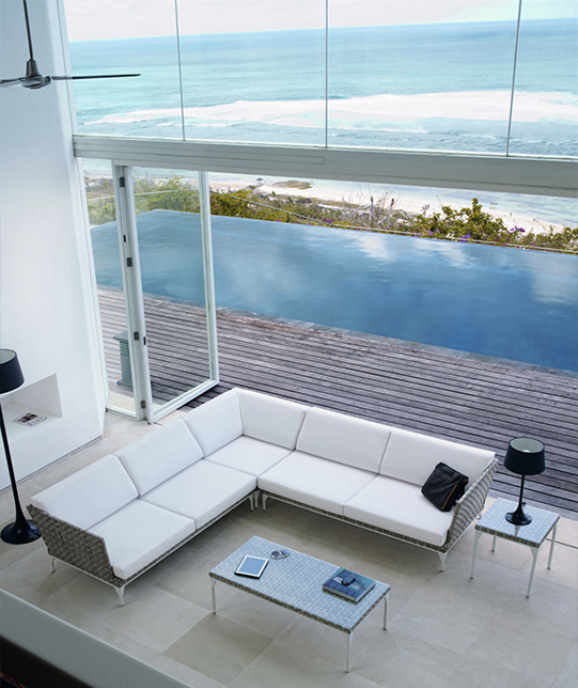 Don't be afraid to blur the line between indoor & outdoor lifestyles. 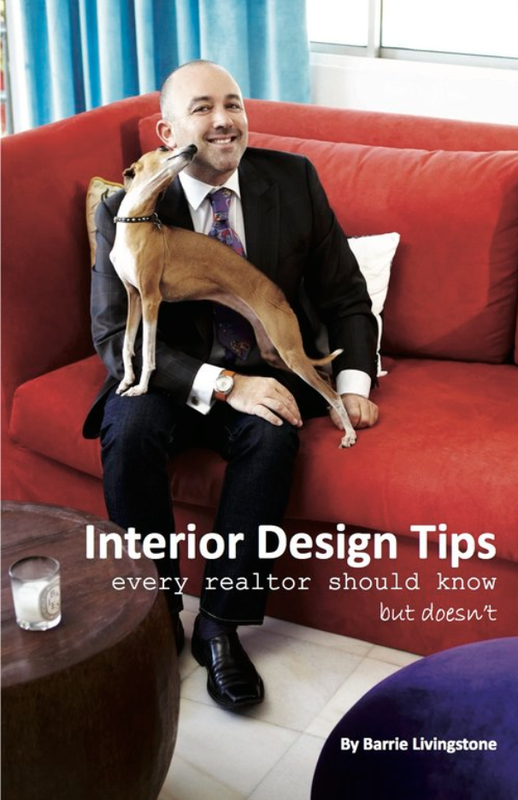 Barrie, whose book Interior Design Tips Every Realtor Should Know But Doesn't is full of great ideas, says: "I always tell people take the bedroom window and make it sliding doors if it's on the ground floor. If it's a second or third story, widen the windows and make them higher. It's not that expensive to do and the difference it makes is almost always worth the cost, especially when it comes to resale value..."
Thom: "I love flooring that goes from indoors to outdoors, and we're using outdoor chairs in an indoor restaurant (they stack so nicely!)" As Libby told us earlier: "I’ve seen a huge spike in client interest in what we call “the fifth room”; people are seeing that they can use their outdoor spaces to really capitalize and almost add more square footage to their homes by creating truly liveable outdoor living spaces. We are also seeing people wanting to blur the lines between interior design and exterior design, and that’s a great thing for all people involved in the outdoor casual living market. It’s no longer just popping up the patio set or a dining table and chairs on your outdoor deck; it’s floor-to-ceiling design, the same way you would furnish in an interior space. Outdoor rugs outdoor furniture outdoor throw pillows, outdoor accessories, outdoor artwork, outdoor lighting...it’s all really taking on the same look as indoor pieces. I also think with the creation of fire and heating elements like fire tables and stylish outdoor heaters, people are saying that even in cold- weather climates they can live in their outdoor spaces for longer than just three months a year! And if people can use the space more year-round then they’re willing to invest in pieces to make them stylish! Visit Steelyard to source designer-friendly, to-the-trade outdoor brands at every price point.